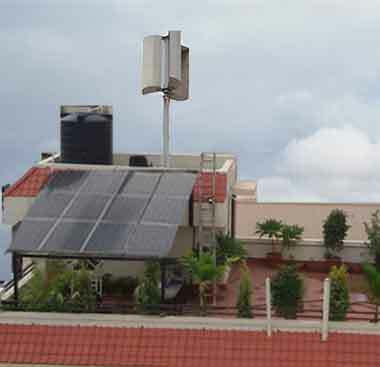 Solar and wind hybrid power system designed by PATPERT using solar panels and vertical axis wind turbine generators for generating electricity. Generally, these solar wind hybrid systems are capable of small capabilities. The typical power generation capacities of solar wind hybrid systems are in the range from 1 kW to 10 kW. Solar energy is one of the major renewable energy resources that can be used for different applications, such as solar power generation, solar water heaters, solar calculators, solar chargers, solar lamps, and so on. There are various advantages of solar energy usage in electric power generation including low pollution, cost-effective power generation (neglecting installation cost), maintenance free power system, etc. Solar power system consists of three major blocks namely solar panels, solar photovoltaic cells, and batteries for storing energy. The electrical energy (DC power) generated using solar panels can be stored in batteries or can be used for supplying DC loads or can be used for inverter to feed AC loads.